People’s Light kicks off its 2018/2019 Season with Such Things as Vampires, a highly theatrical folk-punk twist on the Dracula tale. Infused with lilting ballads, rock anthems, and melodious love songs, this concert-theatre event is an irreverent, bloody, and wickedly fun retelling of Bram Stoker’s 1897 gothic masterpiece. Such Things as Vampires runs September 20 – October 31 on the Steinbright Stage in Malvern. Tickets range from $30-$50. At the forefront of Such Things as Vampires are The Preventers, a traveling band of musicians who arrive in town with a mysterious mission. They share “The Book of Mina” to ward off an encroaching, malevolent presence. The Book chronicles the great love between two young women, Mina and Lucy, and their encounter with The Beast, Dracula. This is a first-time collaboration between People’s Light Producing Director Zak Berkman, Chicago-based director Stuart Carden, multifaceted Philly artist Mary Tuomanen, and musician and performer Jessie Fisher, known for her role in Broadway’s Once and currently starring in Harry Potter and the Cursed Child. With Stoker’s source material as their inspiration, the creative team used the novel as a launching point to look more deeply at the nature of fear of the Other and the borders we construct to protect us from those fears. The Preventers are musical mavericks from the margins of society telling a story that, at its center, is a romance between two women. “It’s a riotous celebration of queer desire and female empowerment,” says co-creator Mary Tuomanen. “Imagine Bram Stoker in a blender with Riot Grrrl Feminism. As a continuation of the theatre’s commitment to music-theatre innovation that includes this past season’s acclaimed premiere of Lights Out: Nat “King” Cole by Colman Domingo and Patricia McGregor, Such Things as Vampires was conceived and developed through the People’s Light Harmony Lab, a program to incubate new music-driven projects supported by the Independence Foundation New Theatre Works program. “Though we have not produced many so-called ‘musicals,’ we’re eager to explore the different ways music and theatre can intersect. We hope to be a destination for new plays where music is central to how the story is told,” says People’s Light Artistic Director and CEO Abigail Adams. 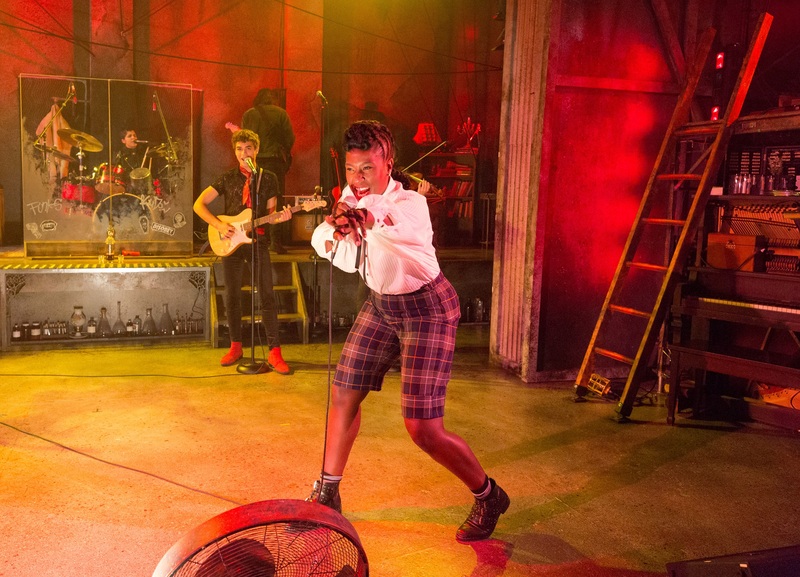 The theatricality of music-theatre framed within a folk-punk concert gives theatregoers an exhilarating synthesis of art forms and musical styles. “Such Things as Vampires aspires to take modern storytelling modes and bardic traditions to a place that feels both ancient and cutting-edge,” explains co-creator Zak Berkman. Demos of the original Such Things as Vampires music are available to sample at peopleslight.org. The cast of six includes Isa Arciniegas, Crystal Lucas-Perry, Alex Lydon, Daniel Croix Henderson, Sam Henderson, and Pearl Rhein, all making their People’s Light debut as The Preventers. Co-creator Stuart Carden (The Miraculous Journey of Edward Tulane) directs the production and Macie Poskarbiewicz (2016 Dramaturgy Intern) returns as Assistant Director. Jamie Mohamdein makes his People’s Light debut as Music Supervisor, Orchestrator, and Arranger, as do designers Arnel Sancianco (Set), Melissa Ng (Costumes), Isabella Byrd (Lighting), and Lee Kinney (Sound). Eli Lynn serves as Fight/Intimacy Director. Resident Dramaturg Gina Pisasale dramaturgs. Rebecca Kestel (Richard III, Three Musketeers (The Later Years), The Cherry Orchard, Row After Row) stage manages. Terrell Green and Amelia Parenteau join the team as EDI (Equity, Diversity, and Inclusion) Advocates. People’s Light will host an LGBTQ+ Night on Friday, October 5 at 6pm, with a pre-show reception sponsored by the LGBT Equality Alliance of Chester County, as well as a post-show Glam-Vamp Halloween Bash after the October 31 7:30pm performance. Visit peopleslight.org for more information.